This is the only official website of Angtropin. 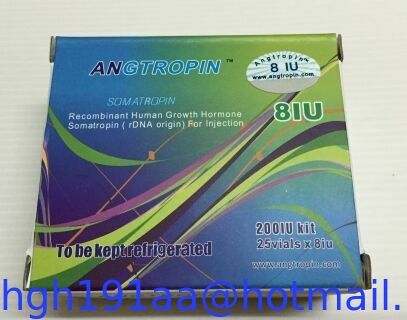 Also HGH Power is not authorized distributor of Angtropin and is selling counterfeit products. Angtropin kit contains 10iu per vials with 10 vials per kit. The carton box has discreet packing. Appearance - Each vial contains 8iu of Angtropin in the form of white powder. Power may look caked or in small particles, that is normal for growth hormone. Dosage - Based on treatment being used for. Daily dosage varies between 0.005mg per kilo of body weight to 0.06mg per kilo of body weight. It's recommended to begin with lower dosage and gradually increase it up to required target dosage. Please act according to what your physician tells you in regard to dosage to not exceed. Angtropin. It is especially important to diabetics to check with their doctor because Angtropin may chance insulin requirements. Side Effects - Angtropin does not have side effects in most people. Most side effects will stop with continued usage or by lowering the dose. Common side effects are pain in joints, this is due to water which may be pushing nerves. If pain doesn't stop consider lowering the dosage, talk with your doctor. Do not use the drug if you are allergic to any of it's components. Please tell your doctor if you have any other symptoms at once. Precaution - Keep a record of doses. If you are diabetic or using insulin or any other diabetic, sugar lowering medicine you should monitor your blood glucose closely because growth hormone may change your body response to insulin. Keep at 2-8C. Don't freeze. Angtropin is very stable and can stay for a month in normal room temperature. But it is still advised to refrigerate whenever possible and always keep away from direct light. After dilution it must be refrigerated. In case of sterile water it must be used within 72 hours. If you dilute with bacteriostatic water you can use even after 10 days or more. Angtropin can be used for various treatments. It can be used in cases of lack of natural growth hormone in children and adults. It can also be used in cases when normal levels of growth hormone are produced but above normal levels are desirable. In children it can be used when lack of natural growth hormone is produced, therefore stature problems may occur so Angtorpin can be given as an aid to increase child growth. In adults it can be used in cases in which natural growth hormone have declined. It can increase muscle mass, decrease body fat and improve the skin elastically and decrease wrinkles. Other treatments in which Angtropin can be used are Turner's syndrome, organ transplantations, burns and traumas.